Found yourself a little frightened by the original rooting method posted last week for the Droid X? As of today, you no longer have to live in fear! A user over at Alldroid has created a one click root/unroot method for the DX and early reviews appear to be very favorable. I’ll admit that I have yet to try this and it is a brand new concept, so approach with caution, but the dev has mentioned adding bloatware removal, app installation, backup, etc. in the near future and appears to be readily available for support. 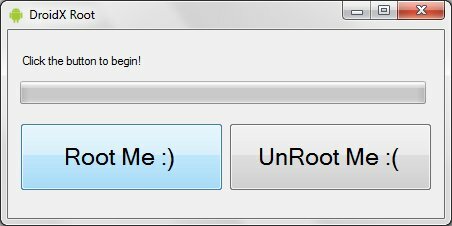 This is a windows-only root tool. Full support at the source link below. And let me know if you get this to work, plus fill us in on any issues you may have run into.